The Museum is in North Somerset; at the heart of the town of Radstock and close to the A367. Radstock Museum, Waterloo Road, Radstock, Bath and North East Somerset, BA3 3EP. There are public car parks in the town. View the location and get directions in Google maps. We are wheelchair and pushchair friendly. Read more in Access for All. The Museum is conveniently located in the centre of Radstock town; close by is the Old Pit Wheel and a beautifully planted civic garden. Follow this LINK to a map which includes these car parks (scroll around a bit to see them all). Please note that the area directly adjacent to the end of the Museum is private land and parking in this space is reserved for residents of the property next to us. Please respect this and park in the public car park which is just a few metres further down Waterloo Road. The Museum is very close to National Cycle Route 24, the Collier’s Way : Bath to Frome via Radstock. Access to the cycle path is at Bath Spa railway station (Route 4). From Bath the route soon enters the celebrated Two Tunnels (Route 244), and then continues to follow the line of the former Somerset and Dorset railway line through magnificent scenery. Cycle Route 24 then follows quiet country lanes to Shoscombe where, nearby, it regains the old track bed of the S&D and so into Radstock. 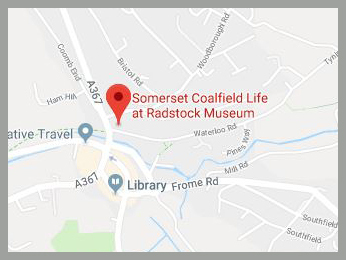 It is then just a short diversion from Route 24 to arrive at Radstock Museum in Waterloo Road: there are cycle racks directly opposite the Museum entrance. Access to the Colliers Way (Route 24) is at Frome railway station. From this direction the Collier’s Way also uses both quiet country lanes and the track bed of the former Bristol and North Somerset Railway; a branch of the Great Western. The line runs into Radstock from the south east. Tickets for the Museum are valid for unlimited return visits in the twelve month period. Our Tea Shop is open for refreshments and welcomes cyclists and walker. You do not need to buy Museum tickets to enjoy the Tea Shop. Regular services run from Bath, Bristol, Wells, Frome and Shepton Mallet. There is a bus stop approximately 5 minutes walk from the Museum. The nearest stations are located in Bath and Frome and then by bus. There is a lot to enjoy in and around this area of Somerset: the city of Bath is 9 miles to the north, Bristol is 16 miles and Weston-Super-Mare 28 miles. Visit Somerset: Visit Bath: Visit Bristol: Visit Weston-Super-Mare are the official tourist sites to check out. The countryside around Radstock is adjacent to the Mendip Hills AONB (Area of Outstanding Natural Beauty). There are many public footpaths which link the communities of the former Somerset Coalfield and these offer excellent walking routes to explore the industrial heritage of the area. The Norton Greenway and the Collier’s Way are footpath and cycle tracks which follow the old track beds of the Somerset and Dorset and GWR railways and both these routes go past the Museum’s front door. There is a local S&D heritage railway at Midsomer Norton within 2 miles.